On the outskirts of Pisa in a back room of a modern block, a machine is waiting for its operator. The device has arms and legs and is suspended by ropes from a metal frame. Its only other tether is a thick umbilical cable plugged into its back. After a few final checks, research engineer Gianluca approaches the machine, turns, and puts his feet on its feet and buckles them in. He straps himself in across his chest and puts his arms into its arms. With a finger he then presses a button, and the machine jolts into life, lights flashing and joints whirring as he cautiously steers his body suit across the floor. The machine is called the "Body Extender" and has been developed at the Perceptual Robotics Laboratory (Percro), part of the Pisa's Scuola Superiore Sant'Anna. It can lift 50kg (7st 12lb) in each extended hand, can exert 10 times the force the user applies to an object, and its makers claim it is the most complex exoskeleton yet built. "This is the most complex wearable robot that has been ever built in the world," says Percro's Fabio Salsedo who leads the project. "It's a device which is able to track the complex movement of the human body and also to amplify the force of the operator." The machine has 22 degrees of freedom each actuated with an electric motor, and is made up of modular components, which means the robot can be easily rebuilt to suit the application, says its designer. "There are several possible applications. For example if you have to assemble a very complex product like an aircraft, this is a machine which is very flexible. You can lift the panel, rotate it and position it in the right position." "Another application is the rescue of victims in case of an earthquake. You need something very flexible in order to intervene rapidly without damaging the victim." Meaning "outer skeleton", exoskeletons are common in nature. Grasshoppers, cockroaches, crabs and lobsters have exoskeletons rather than an inner endoskeleton like humans, providing both support to the body and protection against predators. Turtles and tortoises have both an inner skeleton and an exoskeleton shell. Robotic or mechanical exoskeletons could offer humans the kind of protection, support and strength they afford in nature. The Body Extender is just one of a host of machines now being developed or marketed around the world by researchers and companies. A subsidiary of Panasonic recently unveiled its Powerloader, which it's claimed can also lift a total of 100kg and walk at 8km/h (5mph). The plan is to bring the machine to market in 2015 for work on the factory floor or any other application customers can imagine. Another Japanese company, Cyberdyne, has developed its hybrid assistive limb or Hal system, a range of machines designed for rescue recovery or "back load reduction" in the work place. 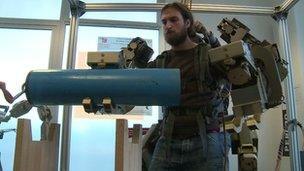 The military application of exoskeletons has become quickly apparent. 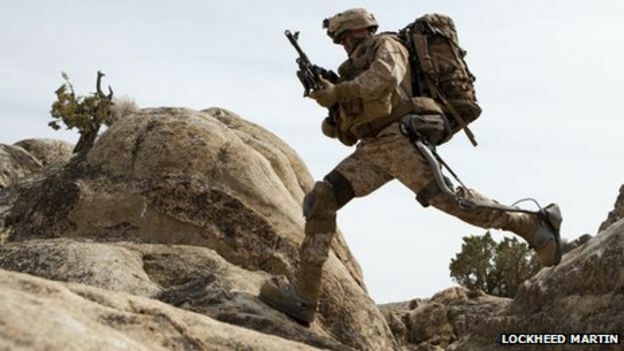 US corporation Raytheon has developed the XOS 2 for combat soldiers in the field, while Lockheed Martin has the Hulc, a hydraulic exoskeleton that provides soldiers with the ability to carry loads of about 90kg. Then there are the medical uses. Israeli company Argo Medical Technologies markets its ReWalk device to help those with lower limb disabilities to walk upright using crutches, while Cyberdyne and Ekso Bionics - which developed the Hulc originally - offer similar devices. Swiss company Hocoma offers a therapeutic device called the Lokomat, robotic trousers worn by a user on a treadmill designed to help stroke patients and others improve their walking, while a similar device called Lopes has been developed by Dutch researchers. Prof Chris Melhuish, director of the Bristol Robotics Laboratory, believes exoskeletons will have a place in the future of robotics where it's deemed humans are still required to steer or control a robotic device or quickly and adaptively respond to environmental hazards or changes. "It's a technology which is growing fast and maturing," he told BBC News. "The type of functionality of the exoskeleton depends on what you want it to do and to what degree you want it to be autonomous." "They can have a medical restorative function, or it can extend to augmenting human function and that might be the case for military systems, rescue services or in factories where perhaps large or heavy materials need to be handled." He said the three main issues were developing the control systems, the materials and, crucially, the power systems. "If you're doing this and you don't have access to sufficient power that's a problem. If you can plug yourself into the mains it's absolutely fine but then your movement is limited by an umbilical power supply. "The evolution of the exoskeleton will go hand in hand with the evolution of batteries or other high density storage systems as well as lightweight structural materials." 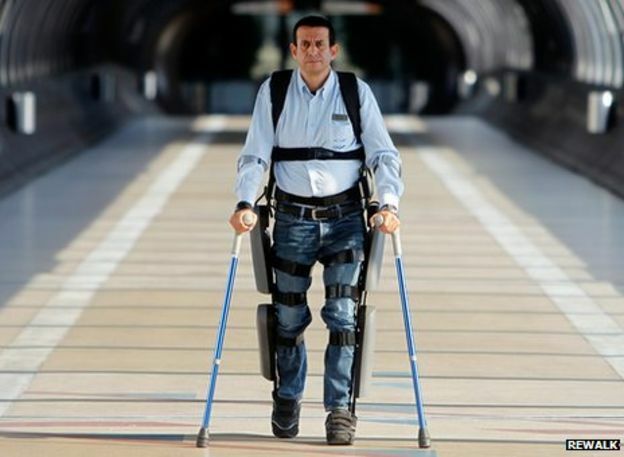 Fabio Salsedo believes the simpler medical devices will become commonplace before the more complex full-body exoskeletons researchers such as he and his team are developing. "There is still a problem with the overall equilibrium of the [Body Extender] machine so it is very difficult at the moment to guarantee the machine won't fall down on uneven terrain," he told BBC News. "But there are other applications of these kinds of platforms which need a simplified version where not all the articulations are actuated but only a subset. In this case the machine can be lighter and more simple to control." Rich Walker, of the London-based Shadow Robot Company, told BBC News: "Exoskeletons have a really important role in keeping older people active and healthy for longer, whether at work or at home. Much of the Japanese effort is focused on delivering systems that can help older people help their spouses without injury." But he agrees safety issues will have to be overcome with some of the more complex devices. 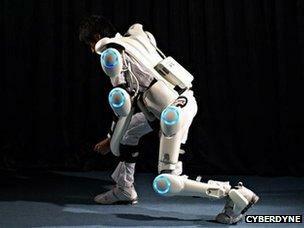 "Safety will be vital for 'on the body' robotics. There is a new ISO standard covering this, but we haven't yet seen what happens when an exoskeleton goes wrong." JinQu Electronics (Shanghai) Co., Ltd.